Everything is bigger in Texas, at least when it comes to gators. Dallas Attorney Levi McCathern shot an 880-pound alligator that measured 13 feet, 8 inches in Leon County, Texas, which is about two hours outside of the Dallas/Ft.Worth area. Saying he wanted to "hunt something that could hunt me" and gaining inspiration from the television show Swamp People, McCathern received special permission to hunt a piece of private property adjacent to the Trinity River. The specific gator he was after had eluded all other hunting attempts for at least three years, but McCathern was able to get the job done. The sharp-shooting lawyer brained the gator from 100 yards as the reptile poked its head above the water, but the big beast belly-rolled into the river, forcing a recovery process that involved a two-ton winch and four hours of hard labor for guide Steve Barclay and deckhand Ryan Burton. After getting the gator into the back of his truck, the hunting party did what any red-blooded Texans would do: they drove to the town square of Crockett and parked for all to see. "We shut Crockett down for a while, even in East Texas a dinosaur-sized reptile loaded in the bed of a pickup truck is a rare sight," Barclay told the Dallas Morning News. 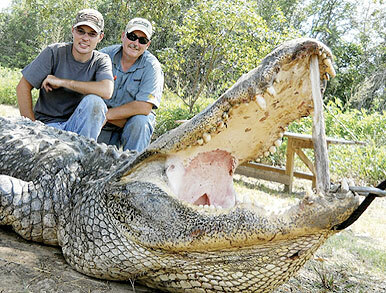 Texas has had a limited hunting season for gators since 1984 with at least four measuring 14 feet. This is the first one nearing that mark to be officially weighed on a certified scale. The longest documented Texas gator measured 14 feet, 4 inches. McCathern, who is the lawyer for Dallas Cowboy's owner Jerry Jones, plans to have the gator mounted in his office. Along with his new trophy, he's picked up a new nickname. "My name is Levi G McCathern...and everybody says it's G for Gator."